When someone wrote on an email listserv that Sally Fallon, the evangelistic cookbook author of Nourishing Traditions, had strongly recommended a ban on all cold cereal (including granola), I bought the book largely to find out what, exactly, Fallon had been thinking. Granola — made in my own oven with Northwest-grown organic oats, local hazelnuts and walnuts, and Portland wildflower honey — is one of my little victories. I'd convinced Truman, my stubborn three-year-old, to eat this for breakfast, and I was far too proud of this accomplishment to dismiss it on the word of some wildly opinionated author. The bit about healing an alcoholic through nourishing food was a revelation for me, and turned my skeptic brain off for a bit. Soon I was deep into Sally Fallon's world. She talks a good deal about whole grains, and I know a lot of this already. Refined grains are stripped of all the nutritious parts, making them empty and lawless calories that rob our bodies of vitamins and minerals. Sending wheat berries through industrial steel grinders pulverizes them, subtly altering their chemical makeup so they're not just nutritionally void but potentially dangerous — proteins altered to the point of toxicity. Whole-wheat flour that's been ground by stone wheels is crushed less disastrously, and is better for you. But, says Fallon, those whole grains — whether crushed gently by stone, cracked, rolled, or left in berry form — are still a little hard for our bodies to use properly. Apparently grains contain a substance called phytic acid which combines with lots of important minerals (iron, calcium, zinc) in our intestines, preventing us from absorbing the minerals. In order to make them "nutritionally available," we must first either ferment or sprout the grains. "Traditional societies usually soak or ferment their grains before eating them," Fallon writes, "processes that neutralize phytates and enzyme inhibitors and, in effect, predigest grains so that all their nutrients are more available. Sprouting, overnight soaking, and old-fashioned sour leavening \[think sourdough\] can accomplish this important predigestion process in our own kitchens." This process, she writes, could alleviate the effects of grain allergies and could work in similar ways for legumes by breaking down complex sugars. Sprouting supercharges the predigestion process, increasing the enzyme activity as much as six times. Fermenting sounds a little frightening, but it's really not that big a deal. Generally, you leave a grain in some sort of milky liquid overnight. Whole-wheat flour is soaked in buttermilk, yogurt, or raw milk (usually in a 1:1 ratio); whole berries, rolled oats, and beans are soaked in warm water spiked with a tablespoon or so of whey or buttermilk. 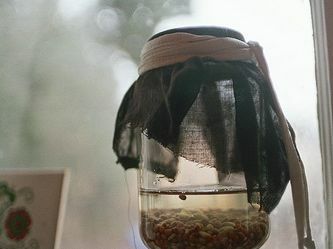 The process for sprouted grains is similar to salad sprouts: you soak the seeds in water overnight, cover with mesh of some sort (I use a recycled glass jar and cheesecloth, but you can buy special mesh-topped sprout containers), and then rinse and drain every several hours until a little sproutlet pokes out. For most grains and nuts, you're only hoping for a sprout of about 1/4 inch. After reading dozens of recipes, I head to People's Co-op and survey the vast bulk-grains section. I want local-as-possible grains, and there are a lot of options. I pick farro (also known as emmer wheat or emmer berries, an ancient Roman grain), quinoa, garbanzo beans, and rye berries. I realize as I'm writing the PLU numbers on the paper bags that the farro is shockingly expensive — nearly $11 for about two pounds. Erp. I'd better really enjoy this farro. And I do. I sprout the farro in a big jar on my counter, and in less than two days the little white bits shoot out. Then it's into the oven, set on "warm," for drying (a step necessary for grinding it into sprouted flour, but not for other purposes — I'm going whole hog, er, berry, though who knows if I'll suddenly come into possession of a good stone-wheeled grinder?). I cook it like rice — boiling water, a little salt and butter, until tender-chewy. I mix it in with my chili; I toss it cold with romaine, broccoli, feta cheese, olive oil, and vinegar; I eat it as a side dish to grilled meat; I try it for breakfast with raw cream, maple syrup, cherries, and hazelnuts. It is delicious, and I do not feel like a hippie. I even serve it to my husband, and he likes it, too. And oh — about the granola. Fallon says the dry heat used to cook it makes it "impossible to digest," though she doesn't inveigh against it as much as she does against extruded cereals and oat-ee-ohs. (She orders her readers, in fact, to remove all cold cereals from their pantries immediately.) I'm not giving it up. But I will acknowledge that I've noticed a significant difference in my, um, digestive-y side effects. Granola is making a transition to a topping for yogurt, oatmeal, berry crisps, and the occasional answer to a little boy jumping up and down asking for seeea-we-ull! seeea-we-ull!